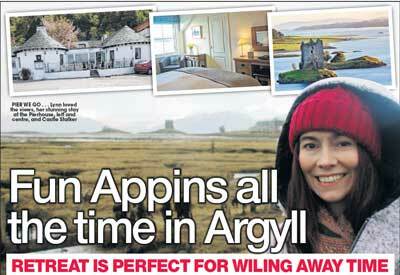 Lynn Kernan from the Scottish Sun and husband decided to escape the madness of city life for a couple of days and headed to Port Appin. Lynn wrote about her weekend escape in the paper - the breathtaking views on the journey through Glen Coe, the relaxing sauna in the hotel, a walk to explore Jubilee Bridge and Castle Stalker. Lynn also talked about her dining experience at The Pierhouse: "The meal was fantastic - fine dining style food with a laid-back atmosphere." An enjoyable weekend away - Lynn said "The Pierhouse really is a little bit of paradise for lovers of picture-perfect views, peace and quiet - and fantastic Scottish fare". Article reproduced with permission of Lynn Kernan, Features Editor, Scottish Sun newspaper.